One of my favorite things about Fairbanks is that it’s a treasure trove of indie businesses and, although shopping here can be challenging at times, there’s a ton of cool stuff to find all over town. So, with 5 days left ’til Christmas, here’s the first ever AK vs AK Holiday Gift Guide! Thriftiques is a great little shop with a nice selection of vintage hats, purses, toys, records, baubles, bottles, etc. There is always something there that’ll catch you off guard and put a smile on your face. Forget-Me-Not Books has a surprisingly varied, complete and extensive selection of used books at great prices. AND it supports the programs of the Literacy Council of Alaska. I scored this pristine copy of Soul on Ice there a few months ago. Win, win, win. I never thought I’d have cause to shop at a garden center until I went to Holm Town Nursery. Of course they have all the typical bulbs, bushes, pink plastic lawn flamingos and whatnot, but they also have pretty ceramic birds, pottery, tiles, candles, and even these great sock monkeys and his friends. There’s also an on-site bistro called Petunia’s in case you need a mid-shopping nosh to re-fuel. It’s easy to get ADD at Expressions In Glass. The store is chock full of Alaska-made goods, cute gifts, and their own fused glass creations. You’ll find everything from Raku pottery and hand-crafted raven sculptures, to local jewelry and up-cycled mittens. I die for those little dream boxes. If there’s a foodie in your life, Country Kitchen‘s your spot. Gourmet coffee, jams & jellies, salts of the world, and the finest in cookware and gadgets. You’d never expect to find a rival to Williams-Sonoma in Fairbanks, but here it is! Alaska Raw Fur is a wonderland of fur pelts. Rows and rows of beaver, otter, fox, wolf, and even skunk line racks throughout the store. Interspersed you’ll find all sorts of furry creations: hats, head bands, coats, mittens, slippers, ear muffs and wolf and bear rugs. You’ll also find traditional Native goods – beaded gloves, moccasins, and my fave, an Eskimo Yo Yo (top row, middle pic) – created by local craftspeople. Blueberry Baby is the place to go for the kids and new parents in your life. It’s another great small business that carries a lot of cool stuff made locally in Alaska. Matter of fact, my cousin’s son is getting that motorcycle tee. Shhhhh! 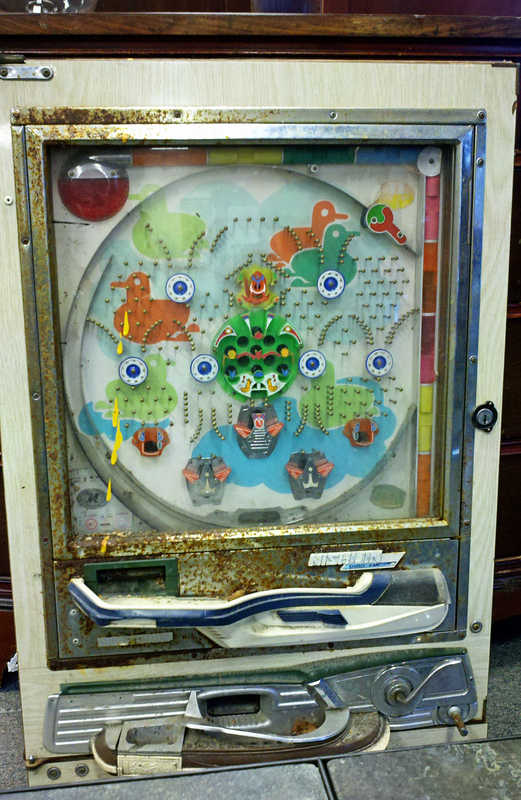 Sometimes they have auctions and sometimes they just have cool stuff like: this Pachinko Japanese pinball machine -which I LOVED and wanted to bring home as a piece of wall art. Unfortunately, I was out-voted. Hmph! So there you have it. Here’s a map of locations if you need help navigating around. Happy hunting! What a great collection of gift ideas and gift shops I hadn’t even heard of! I’ve been here 8 years and there is still more to discover… Thanks. This entry was posted on December 20, 2011 by AK in alaska, christmas, community, Fairbanks, holidays, musings, seen, shopping, tips and tagged alaska, alaska made, art, christmas, community, Fairbanks, fun, fur, musings, shopping, unique, vintage.